Welcome to September! 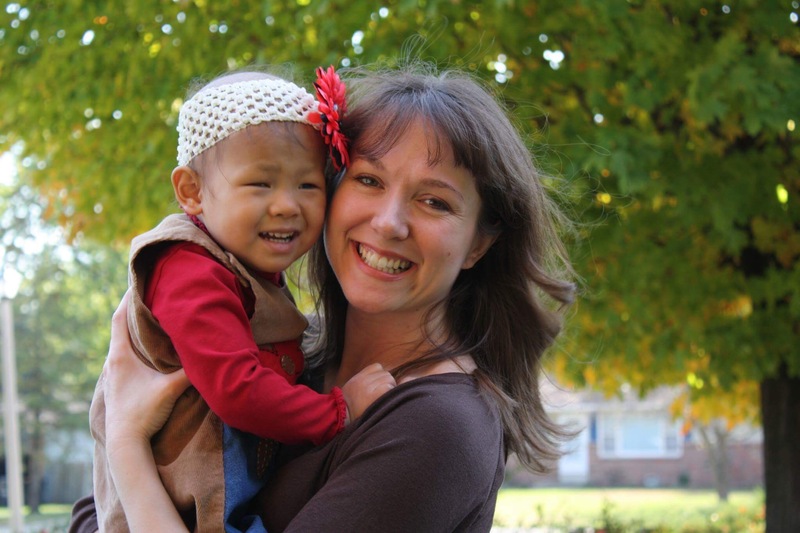 In honor of Childhood Cancer Awareness Month, I will be sharing our own perspective on childhood cancer, as well as posting some guest posts from other people impacted by childhood cancer on this blog. Welcome to September! The first post is by my friend Holly, whom I met at our local pediatric Hematology and Oncology Clinic. 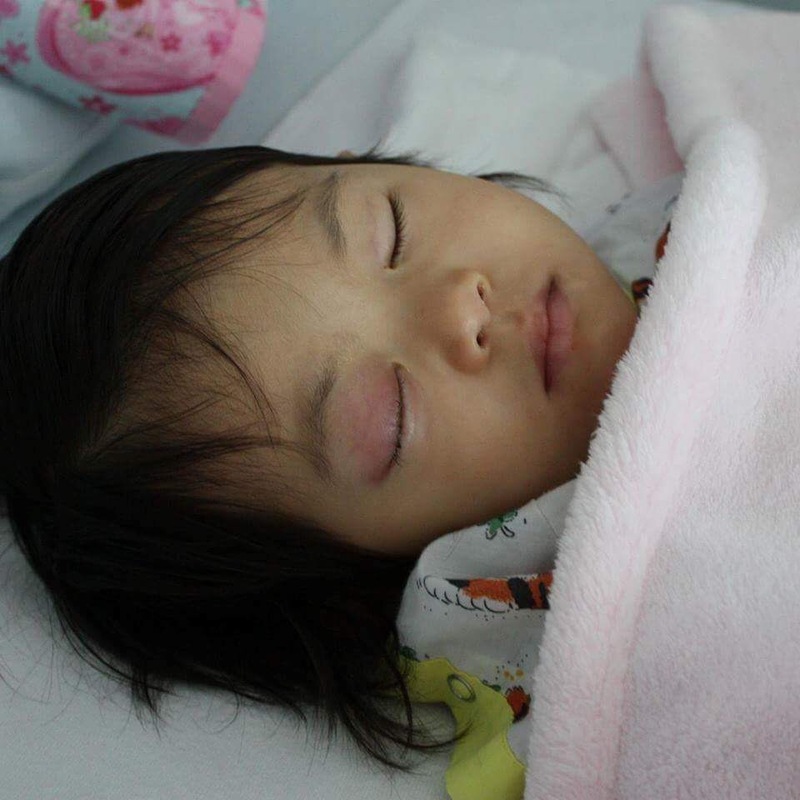 Holly had recently adopted Sarah from China, and after asking her pediatrician about some problems with Sarah’s eye for months, they finally found out that Sarah had retinoblastoma. When I met Holly and Sarah Ben was in his early stages of cancer treatment too. We walked together through a our own difficult paths and remain connected by that bond. Please enjoy Holly’s post from her own blog, “Living the Abundant Life” from the midst of a hospitalization with Sarah. I have a few quiet moments as I sit with a sleeping little girl in our hospital room. We are only here because Sarah’s central line tubes broke, and they were repaired. I don’t have much time at home to just be still and reflect, since there is always something to keep me busy, or my mind occupied. But when I am here I appreciate the quiet times, and my mind so often returns to thoughts of gratitude to God. Because of cancer in our Sarah’s life, I am so grateful to have had so many uninterrupted hours with her that would have seemed impossible to find in our normal home life. I have learned more about her amazing little personality, and enjoyed her so much. I have discovered precious gems about her such as her endurance and strength–her ability to trust and let go of all fear. The way she laughs and enjoys life no matter what the circumstance. I never would have known the extent of the strength of Sarah’s spirit if we had not traveled down this road. I would not have known my little girl the way I know her now. Because of cancer, I have learned about God, and I have come to know Him better than I ever could have apart from it. I have learned in completely new ways that His promises are true. When He says He will give us peace if we trust Him, He really means that. I have questioned Him and trusted Him, and I know whatever the outcome of all of this, I would trust Him still. He has shown Himself so real to me. So real, that at times I have felt completely and totally surrounded and filled by Him. I have learned that the worst, most scary things we can imagine are not so scary when God is walking with you through them. We can’t ever fully understand that until something like this happens. I am thankful for cancer because of this. Because of cancer, I have learned more about myself. I was surprised to find that I have more faith than I thought I had. (I know that was from Him.) I have also learned that that faith could so quickly disappear, and that God loves me either way. I have learned that when I am weak, He strengthens me. I have learned that I really do love adopted children every bit as much as any of my biological children, and that love is fierce. I can survive on less sleep than I thought I could. I appreciate my children and husband more. I have grown as a person in so many ways. Because my daughter had cancer, I have been made aware at the deepest level that childhood cancer is really here, and it is actually all around us, not some far away thing. Sometimes every room on this floor is full. I have gotten to know some of the children and their parents. I have developed sincere love and empathy when before I could only offer a helpless sympathy. I am now able to reach these hurting families in ways I never could have before we walked this path ourselves, and I hope God allows me to use this throughout my life. Because of cancer, I have met some of the most wonderful people I have ever known. My life is richer just because I know them. I watch these doctors, nurses and other staff come to work every day giving everything they have to these children and families. They can’t have a bad day. They always have to keep smiling and loving because they know that their problems are really nothing compared to what these kids go through. I am in awe of their energy. They are not only nurses and doctors–they are counselors and friends, and everyone here knows that most if not all do what they do by choice out of love. 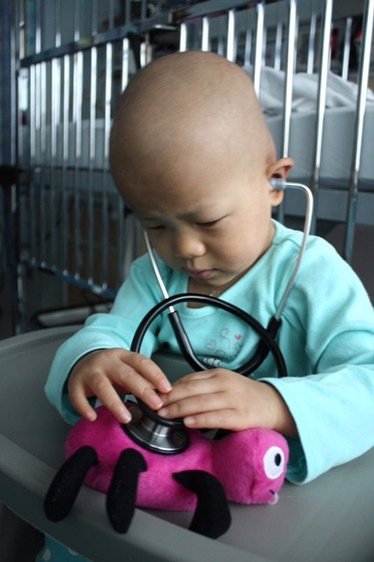 Because of cancer, I have seen the very best in people. Friends we know well, less well, and even strangers have encouraged us, strengthened us, given of their time, money and resources to show us love. My boys have learned through experiencing this what God’s love in action really looks and feels like. I am so grateful to every person who has had a part in our lives through this time. Our precious Sarah is the one who had cancer. She has lived it beautifully. Probably more patiently and joyfully than most people, or even anyone I know could have. God has shown Himself amazingly gracious and powerful in her life through this, and even before that. She already has an amazing life story, and she is not even three years old. I truly hate cancer. But I am grateful for it in so many ways. I can only hope and pray that she will be able to see as she grows that even though it was not fair that she got sick , God is good through it all. I have heard the quote, “Don’t waste your cancer.” I made it my goal at the beginning to make that my goal. To live each day with my eyes and ears open, waiting to experience what God wanted me to learn and gain through this. I am thankful that I did just that, and that He poured His abundance out on me and really all of us, the whole time. My prayer is that Sarah will know God and that same abundance He gives as well. This list really only scratches the surface of everything I could say about this. I would never, ever hope for someone else’s family to hear the news that cancer is in their family, but I want to encourage you that if it ever does happen, do not be afraid! God is so good and loving. He can and will use it for our good if we let Him. I can honestly say, because of cancer I am thankful. What beautiful lessons we all can learn. Praying for continued health and healing. Thank you for sharing!